Learning to make jewelry is as simple as knowing a few of the tools and how to perform several techniques. From there, a whole world of design opportunities lies before you. In this Jewelry-Making for Beginners Series, I've already covered quite a bit of information and several techniques. 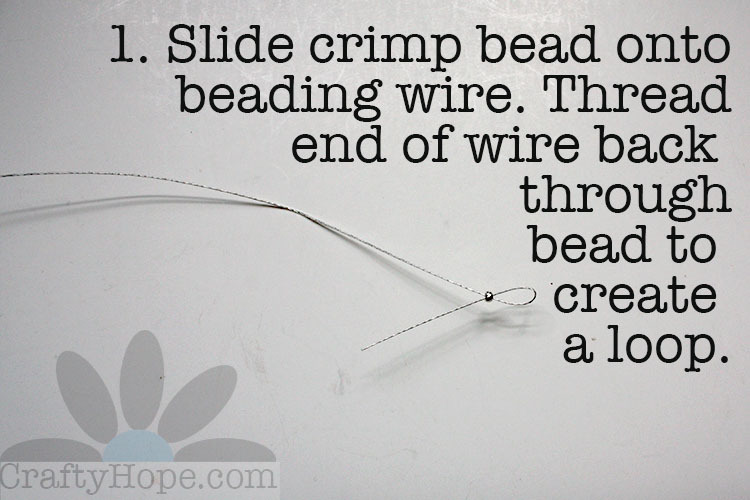 Today, we'll focus on working with crimp beads. In reality, this section could also be referred to as "working with beading wire" as these two materials go hand in hand. Crimp beads are used to secure the ends of beading wire or other thin material (like fishing line/monofilament) so that your beads don't just slide off. The tools and materials are very simple. 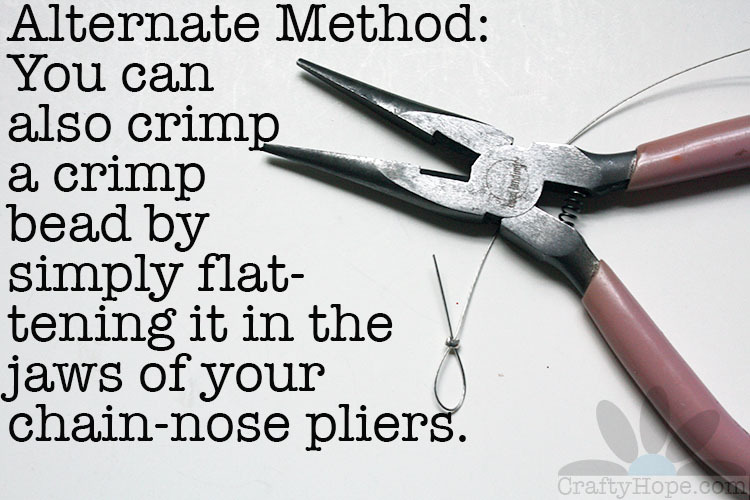 You'll need beading wire, beads, crimping pliers, and crimp beads. There are quite a variety of crimp beads on the market - some larger for larger gauges of wire, some in tube form, some with lines along the side, etc. But, they all work in the same manner. To begin, you'll slide your crimp bead onto the end of your wire, threading the wire's end back through the bead to form a loop. Make sure you leave a bit of a tail on the wire to help doubly secure your jewelry. You can make the loop of your wire as large or as small as you want by re-positioning the bead. From there, pick up your crimping pliers and take a good look at them. You should be able to see two sets of notches in the jaws of the pliers. The set in the front (#1, above in red) are just two basic curves in the jaws. They are used to smash your crimp beads. The set in the back (#2, above in blue) has one simple curve (top jaw) and one curve with a small raised portion in the middle (bottom jaw). This set is used to put a bend in your crimp bead. 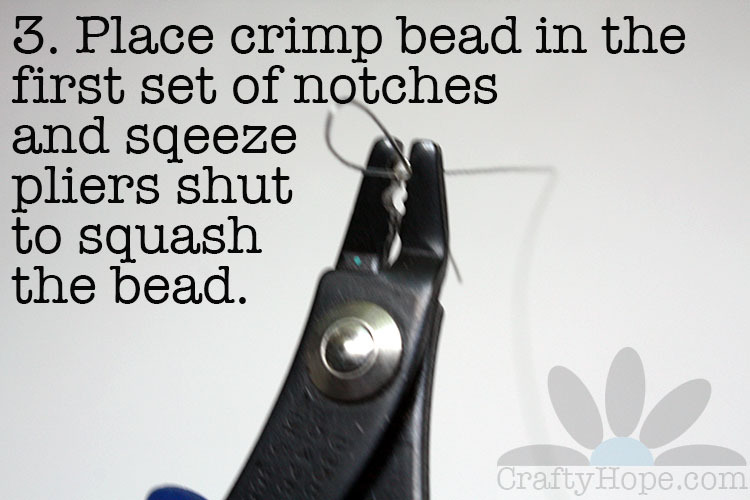 To use the crimping pliers on your crimp bead, place the crimp bead (on the beading wire) between the first set of notches and squeeze the pliers together so the bead distorts into more of an oval shape. You don't want to squeeze so hard that the crimp bead smashes completely. 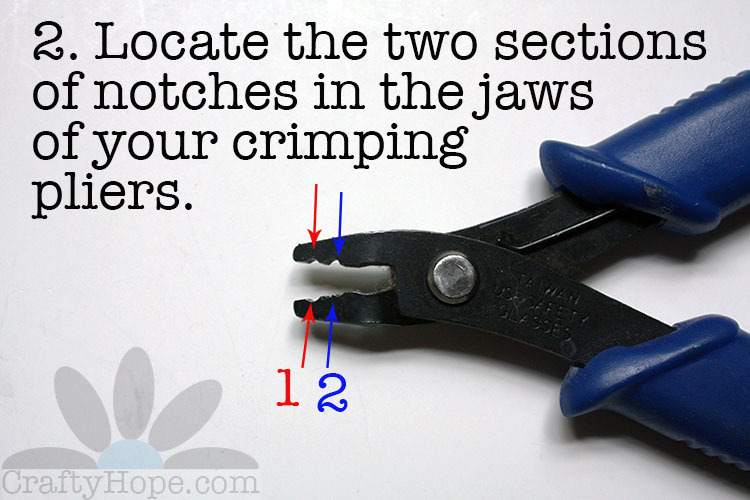 Open the pliers' jaws slightly and move the crimp bead directly back to the second set of notches. 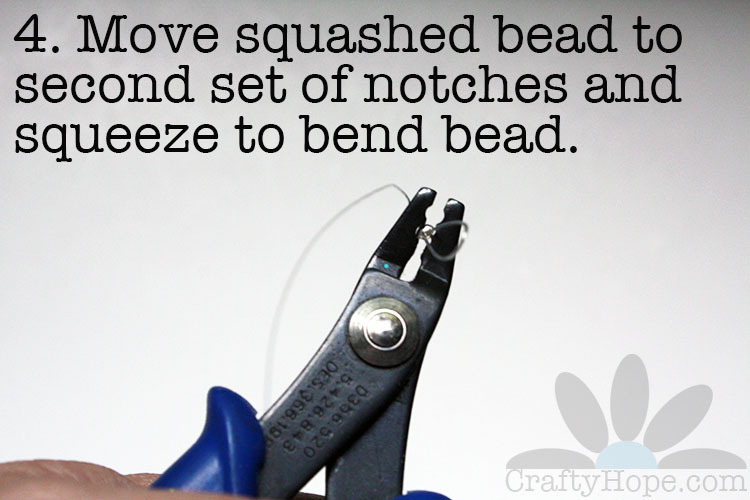 Squeeze the pliers shut again so that the bead is folded slightly. The raised portion of the notch does most of the work for you. Again, open the jaws of the pliers slightly while holding the beading wire. Turn your crimp bead 90 degrees, place it back in the first set of notches, and squeeze to flatten the fold. Be careful to not squeeze too hard as your bead could fall apart from overworking it. I speak from experience. This technique, as with all of them, may require some practice. So, don't get frustrated. Here's what your correctly crimped bead on beading wire should look like. From here, you would add your beads, making sure they cover the tail also. 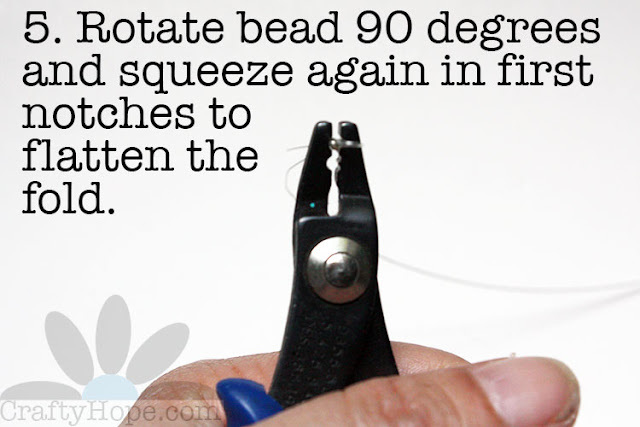 Once your beads are all added, you would repeat the crimping process on the other end of the beading wire. 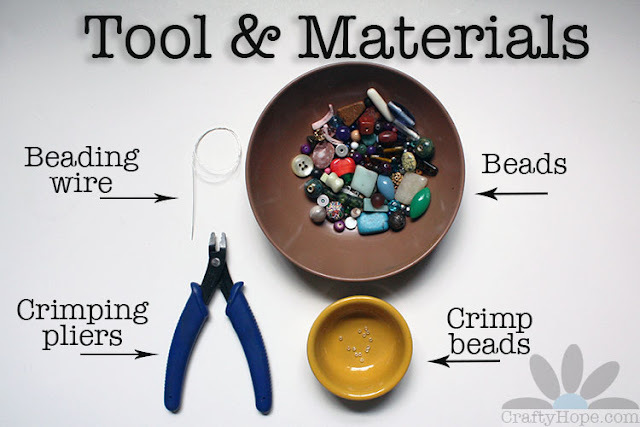 I created a video of the process of crimping a bead if you'd rather watch how it's done. In addition, if you don't have crimping pliers, you can still use crimp beads by simply flattening the crimp bead on your beading wire with chain-nose pliers. 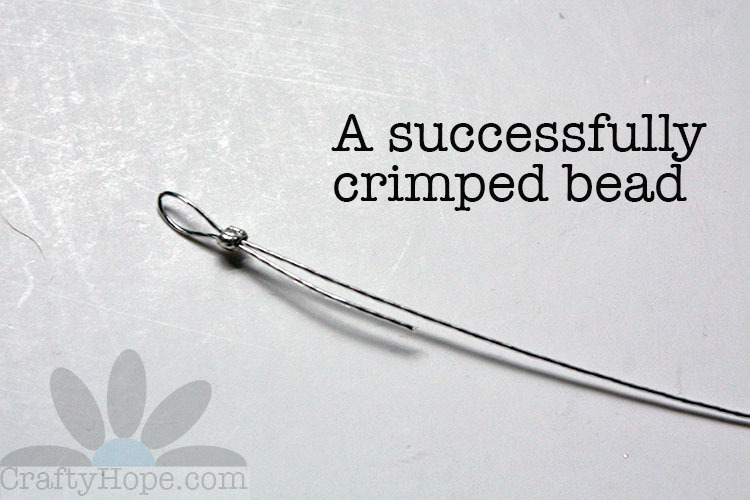 It's a simple process, it just doesn't have that added strength of a folded-over crimp bead. Here are a few examples of how you would use a crimp bead in your jewelry-making. The crimp beads are circled in red. 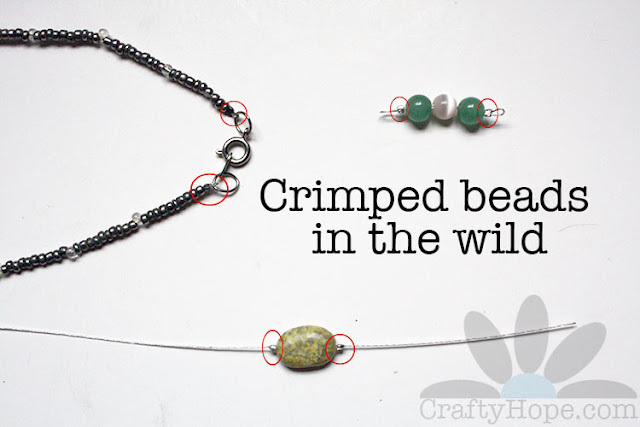 On the left, crimp beads have been used in a necklace (a bracelet would also work) to complete the necklace before the clasp is added. At the bottom, crimp beads are used to create a floating bead by sandwiching a bead between two crimped beads. This technique is often done on fishing line to enhance the "floating" illusion. On the top right, crimp beads are used on a short length of beading wire to create a link that can be connected to another element. 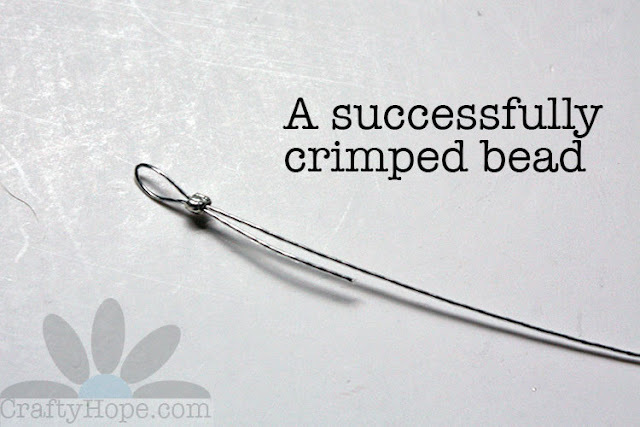 I've also seen jewelry artists use crimp beads on beading wire without creating the loop. However, I prefer the doubling up for extra strength. It's simply a personal preference. I encourage you to try out and experiment with this technique to find out what you prefer. As always, please don't hesitate to let me know if you have any questions, comments, or additional information about using crimp beads.